Lina thought surviving her Yellowstone vacation was hairy. She doesn’t even have time to enjoy her newly discovered powers with her two hunky dragons before they and Brodey Lyall’s wolf pack must band together again to find out who’s responsible for grisly dragon murders. As Lina finds out how deeply their tragic past is entwined with the present, new allies join their quest to hunt down the killer before he can strike again. But the more Lina learns about the past, the more questions she has. In their transcontinental journey for justice against the vengeful and psychopathic cockatrice, Lina and her ever-expanding adopted clan have to rely not just on her random and unreliable incendiary powers, but on the skills and memory of a sadomasochistic immortal. The future happiness of the Lyall brothers depends on it, as do all their lives. And she doesn’t even have a Goddess 101 handbook. 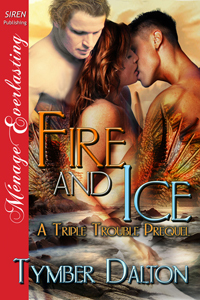 Note: This book ends on a cliffhanger and the story continues in the Triple Trouble series.